I’ve been wanting to see this show since my sister told me about it. I just started this drama and I’m already in love with it. I love the main characters. The main guy in this show is from another show called Iljimae, which is one of my favorites. It’s pretty high up there with a couple of other Korean dramas. This is going to be more detailed than the others I have seen. There will be major spoilers in this post. Eun Oh is a nobleman and the kind of person who doesn’t like butting into other people’s business. He turns a blind eye to injustice. He had lost his mother and at this point we don’t know what happened to her and neither does he. We just know that his mother had a child with his father who holds a high position. In the beginning of the first episode you see him and his assistant, Dol Swe, were poking around in a wooded area to investigate the whereabouts of his mother. Meanwhile, you also see that Arang is in the area as well. The area that they are all in is apparently a common place where ghosts tend to appear. Arang is a ghost and in this drama, ghosts are marked. The have a tattoo of a circular symbol imprinted on the left side of their neck. Some of these ghosts are lost souls. They have to keep eating in order to not disappear. Some also do not remember who they are and what happened to them. Arang is one of those ghosts. It is a rule that ghosts do not do any hard to humans and cannot seek revenge. If they ever harm humans, there are the angels of death that descend on earth and capture those vengeful ghosts. In this way, order is kept and humans are protected from being tormented. So to keep things short, Eun Oh happens to meat Arang who is trying to get away from the angel of death chasing her. Eun Oh and Dol Swe decided to stay overnight in a small shack until morning. Arang goes inside and she doens’t realize that Eun Oh can see her. She starts to undress but then catches Eun Oh staring at her and looking shocked. She puts her clothes back on and she is questioning herself whether he can see her. Eun Oh is telling himself that he doesn’t see her and he wants her to go away. Arang is relentless and frankly a little curious. She decides to stay even though Eun Oh doesn’t want her to. He is still pretending not to see her. She is bored and really has no one to talk to so she starts to tell him a story of her ghost life and what she remembers. She tells him that the last thing she remembers was the day she was following the angel of death and that she had died 3 years ago. She doesn’t remember much of anything. Later on the next day, Eun Oh and Dol Swe see a mysterious man and another nobleman (Nobleman Choi) on horseback entering the town, Miryang. Nothing is really known about the mysterious man, who I’ll call Joo Wal, but I just have the feeling that he is up to no good. Nobleman Choi controls Miryang and he had been demoted by Eun Oh’s father. Throughout the episode Arang won’t leave Eun Oh alone and she is relentless. She wants to find out who she is and she wants Eun Oh to help her. Euh Oh, on the other hand wants nothing to do with her. It is his inaction that is a bit annoying. I think we will see that Arang will change him in to a better person because she will eventually convince him to help her on her quest. He tells her that if he becomes a magistrate then he will help her. She then hatches a plan to do just that, make him magistrate. She makes the shaman appear in front of the officials of Miryang to tell them where they could get such a man to act as magistrate. Then kidnap Eu Oh and keep him locked in a room. The reason why they are so afraid is because every magistrate in past years had died. Arang is actually at the center of this occurrence. Once she had entered the afterlife, she was so curious as to who she really was and she desperately tried to ask the magistrates for help. She found an herb that would allow her to appear in front of the magistrate and she used this to speak to them. All of them were weak of heart and collapsed/fainted at the sight of her. So, making Eun Oh the magistrate is like an offering to the ghost they think is terrorizing them and taking the life of whoever is magistrate. Arang, again, asks Eun Oh to help her but he refuses. However, he noticed that she was wearing a hairpin that he had given his mother before she disappeared. He is intrigued as to why she had it and Arang told him that she had it already when she died. So because of this, he decides to help her. The scenes of Hades and the Jade Emperor are scattered throughout the show. They seem to rule the world and what is happening in it. They are always shown playing a game which will be clear later as to its meaning. Also, you find out that the main guy leading the angels of death (Moo Young) had a sister once. He lost her. We don’t know why yet which I am sure will be revealed at a later episode. Later we find out the true identity of Arang. While Eun Oh was looking around he found a room that hadn’t been touched. It is a girl’s room and you start to think that this may be Arang’s old room when she was alive. An old woman who is watching over the room tells him that the girl who lived there died 3 years ago. 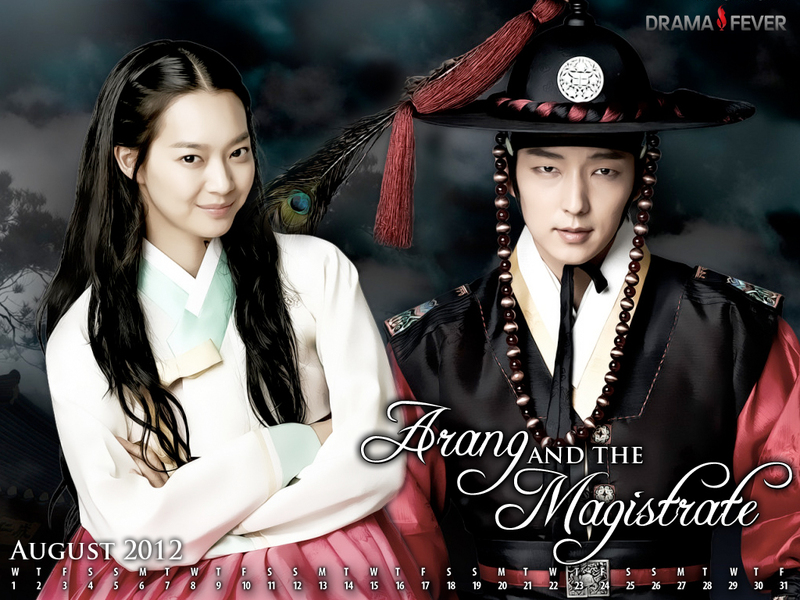 She also tells him that Arang is the daughter of one of the magistrates of Miryang. This is when he realizes who Arang really is and that her real name is Lee Seo Rim. Lee Seo Rim had been engaged to a nobleman and rumors say that she cheated on him with a lowly commoner and never seen again after that. He tells Arang all of this and she is determined to meet her former fiancé. They go to his house and you see that it is Joo Wal. So now I’m thinking maybe he used her as some sort of sacrifice. In episode 3 they finally found Arang’s body. Her body has not decayed which is odd. Eun Oh checks to see if the hairpin is with her and it is not. He begs Arang not to look but she does anyway. She is devastated and runs away. Joo Wal enters the scene and says that Nobelman Choi wants the body to be sent to him. Eun Oh intervenes and he takes the body away and has it sent to his office. He is suspicious of Joo Wal and he wants to keep the body safe. Arang finds the shaman and asks her for her help once again (against her better judgment). She doesn’t tell the shaman what she plans on doing but all Arang tells her is that she want to trap someone. The shaman leads Arang to a seemingly abandoned area and prepares her things. She puts up a sheet on the wall in order to trap whoever Arang wants her to trap. Like I said before, angels of death come when ghosts do bad things. Arang infected the shaman with some sort of skin disease, which she tells the shaman will disappear eventually. Moo Young shows up and the shaman is terrified. Arang means to capture him. She first asks him to see the Jade Emperor because she figured that he had seen everything that went on with her murder. She wants to get to the bottom of the mystery surrounding her death. Moo Young eventually agrees. Eun Oh tries to look for Arang but cannot find her. He finally goes to the shaman and he tells him what happened. Arang and Moo Young finally reach the river Styx and travel upon it. He tells her that she cannot go back once she goes on this journey. He also asks her what she regrets and she tells him that she regrets not saying goodbye to Eun Oh. She thinks that he led her to Hell instead of to the Jade Emperor. The shaman explains to Eun Oh that the crimes that you commit in the afterlife are far worse than those committed when you were alive. Since Arang committed many crimes in the three years she was already dead, she is sure to go to Hell. Back at Eun Oh’s office, Dol Swe is attacked by hoodlums sent by Nobleman Choi and he tries desperately to protect Arang’s body. Eun Oh comes to his aid as he is about to get killed. Eun Oh reminds them that he is Nobleman Kim’s son and that they will all be in trouble if they continue this fight. After giving up on ever seeing Arang again, Eun Oh decides to give her body a proper burial. He posts a notice around town for people to come and ask for forgiveness for spreading the rumor about her running off with some commoner. The townspeople see the notice and a couple of people were saying that it is ridiculous that the magistrate is requesting such a thing and that they do not need to apologize for anything. Joo Wal then appears at the scene and the people scatter. As Eun Oh is about to leave his place, he sees Arang walk up to him. He is surprised to find that Dol Swe can also see her. She tells Eun Oh that she became a person because both Hades and the Jade Emperor allowed it to be so. However, Hades mentioned something about a deal with the Jade Emperor to make this possible. If she cannot solve the mystery of her death, she will be sent to Hell. They give her 45 days to do this. The Jade Emperor will ring a bell to signify that she has accomplished what she went down to Earth for. However, for the bell to ring, she has to kill the one who killed her. The following scene with Hades and the Jade Emperor reveals what their game is about. Whenever Hades wins, many people will die by either war, famine or any other tragic disaster. Joo Wal finally sees Arang and he recognizes her but she disguises herself as an officer so she can attend her own funeral. It seems as though she is the girl he had been looking for because his ring changed to a red color. I think he may have been in love with her when they were engaged but I can’t be sure. Eun Oh sees Arang at the funeral and tries to catch her but she gets away with the help of Joo Wal. Eun Oh and Arang agree to work together to solve the mystery of his mother and her death because they appear to be related. He hands a peach as a peace offering. Meanwhile, Joo Wal speaks to this woman who asks him if he is ready. He says yes. Then she says “I have big expectations for this girl this time.” There then appears a small knife on the ground which he picks up. Maybe Arang is a sacrifice. We do not know yet. He goes to where she is sleeping and stabs her in the heart, killing her. He then lifts her up and sticks, what looks like a yellow paper with a symbol on it on her neck. It disappears immediately when he does this which makes me think that it is probably a charm or spell of some sort. Later you find out that it was a spell to take away her soul. Joo Wal takes her body and Eun Oh follows the trail of blood to find her. Eun Oh loses the trail and Joo Wal brings her to a room with symbols written on a black wall. He leaves her there and then he remembers when he got the ring he has and who gave it to him. It was the witch who asked him if he was ready to get the girl. She tells him that on every leap month full moon he has to bring her a pure girl. The ring shines red every time he touches a girl who is pure. The scene comes back to present day and the witch comes to the site where Joo Wal had brought Arang. She lifts the veil she has over her face and it is none other than Eun Oh’s mother (Lady Seo). This really surprised me when I saw that it was her. Lady Seo goes to Arang’s body but when she gets there, the body is missing. You then see Arang running through the woods clutching her chest. Eun Oh finds her and takes her back to his place. He looks to see if she has a wound where she was stabbed and she does. Everything about this is pretty odd. Even Joo Wal is confused by everything that has happened. Lady Seo berrates Joo Wal because the girl is gone and it will be a while before another leap month full moon occurs. Eun Oh brings Dol Swe with him to the mountain where Arang was brought to the night before. They investigate and he finds the shack. He also finds his mother’s hair pin in there which confuses him even more. We find out in episode 6 that Lady Seo is Nobleman Choi’s wife. We know that she had adopted Joo Wal just to give him the task of finding her girls who are pure. Since he failed, Nobleman Choi tells him that she will replace him because he couldn’t do his job correctly. On the mountain, after Eun Oh finds the hairpin, Dol Swe finds a square pit. Eun Oh goes into the pit because they noticed bones. Eun Oh thinks it might be his mother but as he keeps digging he finds more bones. There were more people buried in there. He then enlists the help of more people to uncover the mystery of the pit. Lady Seo senses that they have discovered the area where all the bones were buried and she sends Joo Wal to investigate immediately. Back where Arang is laying, she wakes up and discovers that she cannot die or get hurt. The Jade Emperor and Moo Young talk and we find out that the mysterious deaths of people have been happening for 400 years now. Both soul and body go missing. The Jade Emperor wants this mystery to be solved. Eun Oh searches through all the belongings of what they found in the pit and he can’t find his mother’s things. He still thinks that she is alive. He then sees Arang and wants to take her back to the shack because he believes that she died there since the pin was found there. She doesn’t want to go. He is persistent and he tells her that it doesn’t matter if she dies because she will come back to life again anyway. She gets angry at him and tells him that he doesn’t know what dying feels like. He takes it so lightly and he is using her for his own gain. She wants to remember what happened to her but he is rushing her too much. The memory and the pain of losing his mother always takes over and Arang suffers for it. He should be more sensitive and support Arang because without her, he would not have any leads as to where his mother is or what happened to her. Arang goes to the mountain by herself and she remembers something about the hairpin. She remembers taking the hairpin from a lady’s hair. Lady Seo orders Joo Wal to murder Eun Oh. He goes to his place but he acts too late because Arang gets there before he decides to kill Eun Oh. He is surprised to see her because he thought that he killed her. He is now worried about what to tell Lady Seo. He has failed her twice now because neither Eun Oh nor Arang are dead. Eun Oh goes back to the pit/gravesite and he finds it odd that there are no signs of ghosts anywhere. This is probably due to the spell cast on them by Joo Wal. The people who died there do not have souls. He then finds black pieces of cloth with markings on them. He also finds the black cloth with a marking on several trees. He takes most of them down but one. He finds the last one which is on a tree over a cliff. He tries to reach for it and when he gets it, he slips and falls over the cliff. Here we find out that Hades and the Jade Emperor were waiting for this to happen, for all the black markings to be removed. The black markings were actually hiding Lady Seo’s area there in the mountain. Now that they are all gone, her place is no longer hidden from them. Moo Young is sent down by the Jade Emperor to investigate. He looks at the black cloths and he thinks that Lady Seo might be his sister. Arang looks for Eun Oh and finds him. They can’t get back up so she drags him into a cave. A demon shows up in the area and tries to harm both of them but Moo Young shows up and saves them. It turns out that closing the area that Lady Seo owns triggered the event of the demon showing up. The cave also seems like it is going to collapse so Eun Oh and Arang both come out of the cave. They see that Dol Swe is waiting outside. He pulls Eun Oh up but when Eun Oh tries to pull Arang up with the rope, it snaps. Arang falls, hits her head on a rock down below and falls into the water. Eun Oh is determined to go down to her but he passes out. Lady Seo has a conversation with Joo Wal and she tells him to get close to Arang and that this is not that time to kill both Arang and Eun Oh. She also wants Joo Wal to find out with Arang wants. Lady Seo then goes into an underground area of where she lives and she starts talking. We don’t know who she is talking to but she seems like she is talking to two pots in front of her. She says that she doesn’t trust any humans and that she can only trust them. Then two, what seem to be, death angels come out of the pots. Dol Swe comes back with Eun Oh and says that Arang fell off the cliff. Joo Wal happens to also be there with the officers so he goes to find her. Joo Wal finds Arang at the base of the cliff by the water. He carries her to his horse and brings her to his place. Eun Oh regains consciousness and looks for Arang. He goes to the mountain because he thinks that she is there. He discovers that the pit/graveyard that used to be there had disappeared. The officials had covered up the area because Nobleman Choi wanted it so. From here the truth is slowly unraveling and Moon Young finds out that Lady Seo is actually his sister. The Jade Emperor and Hades both know this but hid it from Moon Young. Moon Young is also confused at how Eun Oh is so strong and that he has a fan with symbols on it that can kill angels of death. He goes to his place to find out and tries to take the hair pin and fan. He and Eun Oh get into a fight. Eun Oh won’t tell Moon Young where he got the hairpin and fan but he does say that he got them from the same person. Eun Oh later tells Arang that he got them from his mentor. The symbols on those items are of the Jade Emperor’s. So now the plot thickens and there are still many questions unanswered. Joo Wal still is trying to woo Arang but it doesn’t seem to be working. Arang asks Joo Wal about his engagement with the dead woman and he said that both of their families arranged the marriage and that it was political. Neither Joo Wal or the woman wanted to get married at the time. Eun Oh goes to Arang’s room to investigate and finds her journal. In it she has written about her wedding and from this it seems like Joo Wal was lying. It didn’t seem like a loveless wedding. Arang now believes that she has been tricked by Joo Wal and that she should have listened to Eun Oh when he warned her about Joo Wal. Later, the shaman is trying to figure out who Arang really is because she had recognized her voice earlier. She follows her into an alleyway where they both get kidnapped. Eun Oh gets a message with an arrow that they were kidnapped. This is all Nobleman Choi’s doing. He is retaliating because Eun Oh keeps going against his plans. Earlier, Eun Oh freed a man that he had captured and then later he opened up Nobleman Choi’s food cellars and gave all the food for free to the townspeople. Eun Oh finally goes to rescue Arang and the shaman. Joo Wal is also there and helps by killing one of the kidnappers. No one knows it was him but this scatters the men a bit so they would be easier to fight. Arang and the shaman get away only to get caught again several feet away. Arang gets killed again right before Eun Oh arrives to save the shaman. He sees Arang’s wounds heal and he gives her “mouth-to-mouth” as Joo Wal is watching. Joo Wal is hurt by this and you can see that he is on the verge of tears. He had fallen in love with her already but cannot do much about it because Arang likes Eun Oh. At this point the shaman finds out that the girl is Arang because Eun Oh was calling out her name. Moo Young finds out that only he can destroy Lady Seo, which is his sister Moo Yeun. He is devastated when he finds out. Eun Oh notices that he still has the talisman he took from the gravesite. Arang sees this and she recognized the same symbol that she saw at Nobleman Choi’s house. So Eun Oh goes to check to see if it is 100% true before they make any assumptions. The talismans are the same and they go to the shaman to see if they can do anything to counteract it. Somewhere along the way, it is revealed that the Jade Emperor was Eun Oh’s master/tutor when in the past and that is how he came upon the fan and the hairpin. The Jade Emperor gave those things to him in preparation to take down Lady Seo/Moo Yeun. The only way that Lady Seo can be killed is by someone who is family or related to her. Since Lady Seo is in the body of Eun Oh’s mother, Eun Oh can kill her while in her human form. When separated from the human body, Moo Yeun can be killed by her brother Moo Young. Moo Young attempts to kill Lady Seo but cannot because it’s his sister. However, at another time, he returns with Eun Oh to kill her. Their plan is foiled because Eun Oh sees that Lady Seo is his mother. He tries to protect her. Eventually Moo Young gets to her and tries to kill her but discovers that he cannot. Apparently he did not know that he couldn’t kill her while she is human. Eun Oh goes home surprised and does not know what to think of what had just happened. Arang asks him but all he could say was that he met his mother. He told her that he would tell her everything later. At another time, Eun Oh does finally tell Arang that his mother has been possessed by a monster. They both go to where Lady Seo is staying. When Arang sees Lady Seo she remembers everything about what had happened. She saw Eun Oh’s mother meet Joo Wal on the bridge. She followed them to see where they were going. She then sees Moo Jeun in another woman’s body (Not sure if I explained this before but this is the way Moo Jeun gets to live a human being. She takes over the bodies of different women in order to stay human. The person has to be alive for her to do this. She has been using the pure souls of dead girls to live longer as well. This is what Joo Wal and countless others have been doing for 400 years now. ). So Moo Jeun wanted Joo Wal to bring Eun Oh’s mom’s body to her so that she could switch bodies again. Arang sees all of this. Eun Oh’s mom is surprised by this and she tries to resist the possession of her body. She takes tries to kill herself with a knife and Joo Wal stops her. She then decides to kill Joo Wal for bringing her to such a place and letting this happen to her. Before she could stab him, Arang steps in to try to save him. She dies in the process. Lady Seo tries to get close to Arang and Eun Oh tries to stop her. Eun Oh tries to use his fan to kill her but fails. Lady Seo uses one of her hairpins to destroy the spell on his fan. She then goes on to try to stab him but Arang saves him. When Eun Oh and Arang return to his place, she tells him everything that she remembers. He is in disbelief that his mom actually killed her. This means that for Arang to get into heaven, she has to kill his mother. Also, what I didn’t mention earlier was how Eun Oh’s mom got to live at Nobleman Choi’s place. She had been holding a grudge against him for quite some time now. Her father was framed by Nobleman Choi and was falsely accused of treason. The whole family was killed but she was spared (probably because she had a child with Eun Oh’s dad who is Excellency Kim…very powerful.). She swore to seek vengeance. So she went to Nobleman Choi’s house to kill him. She pretended that she wanted to do work at his place. She worked there for a while before trying to poison him through his soup. She was caught and that is when Moo Jeun took her body. The scenes with Nobleman Choi are quite annoying if you ask me. He gets Eun Oh and Dol Swe arrested for high treason. Eun Oh’s father comes (with the help of the three officers) to rescue his son (he brings an announcement from the King). All is well again for the magistrate as far as his job is concerned. As for the mystery with Arang, they are quickly getting to the bottom of things. Eun Oh goes to the shaman and searches for answers. He finds out that there is no way that his mother can be saved, even if Moo Yeun releases his mother’s body from her control. Joo Wal moves Lady Seo to a couple of different locations to protect her. Arang decides to go meet Lady Seo on her own to try to save Eun Oh’s mother. Moo Young is waiting outside of where Lady Seo is hiding. He wants to kill Moo Yeun to free her soul. This doesn’t work and Eun Oh shows up at the scene and is angry at Arang for trying to do this on her own against his wishes. As you noticed, the Jade Emperor’s bell did not ring. Arang did not find the truth of her death yet. Eun Oh goes to the shaman again to ask her about the truth of Arang’s death. The shaman tells him that he has to go to a library where they have the books of life and death. For him to go there he has to go through the Afterlife forest. Arang is the only one who knows how to get through it. So they both go there and Eun Oh goes through the books and finally sees Arang’s name. It says that she killed herself. At this point you realize that the answer has been staring us in the face all along, ever since she remember what happened to her. No one kills her because she stood in the way of the knife and Joo Wal. Eun Oh also sees his own book and it says there that he died when he was 6 years old. I’m not sure if I mentioned this before, but he died because he got really sick. The Jade Emperor lengthened his life on purpose so that he could use him in his plan against Moo Yeun. Eun Oh is furious because he now realizes that everything that has happened has been according to the Jade Emperor’s plan. Arang has no way of getting to Heaven because she cannot kill herself even if she tried. She is immortal. Now that he has found out the truth, he and Arang try to escape the forest. Arang trips as they are running and wakes up first. Eun Oh is left behind for a little while. Arang is then pulled towards a vortex that leads to Hell. At this time she realizes the truth on her own, that she had killed herself. As she is waiting to be sucked into Hell, Eun Oh appears and pushes her out of the way. He goes to Hell instead and the bell rings. Arang then disappears and I am assuming that she goes to Heaven. The drama fast forwards into the future. There is a little girl in a field. A little boy approaches her. He is trying to get away from his mother (the shaman). The shaman and Dol Swe had gotten married. The boy tells the girl that he had seen her before. The girl gets mad and tells him that he should not have drank from the well of forgetfulness. Time fast forwards again and it is the same Eun Oh and Arang sitting in the same field. She berates him again about drinking from the well of forgetfulness. He tells her that it doesn’t matter now because they were both there together. Then they kiss. This show may have made it to my top three favorite Korean Dramas. I loved the relationship between Eun Oh and Arang. Arang changed Eun Oh so much. At the start of the show, Eun Oh was a pretty terrible guy. He didn’t care about anyone but himself. He always minded his own business even though other people may have needed his help. Arang changed him into a better person. She kept on saying that she saw good in him and he kept on telling her that she didn’t know how to read people. I think it was her persistence and his love for her that changed him. They say that people do anything for love and they change for the better in the process. Eun Oh changed and he started helping people more. He cared about other people’s lives and feelings. He helped so many townspeople and they were grateful for it. The town that was once dead and full of corruption became a town full of justice. Their love for each other was so sweet. The would do anything for each other, even go to the depths of Hell if they had to. I liked how the writers decided to have them reincarnate and end up together again at the end. I would have been really disappointed if it ended with Eun Oh going to Hell. It would just not have been right for them to be separated forever. As for Joo Wal’s character, I felt sorry for him. All his life he had suffered. The only family he had ever known was Lady Seo. In a way, Joo Wal, Eun Oh and Arang are very similar in terms of what they want out of life. They just want to be understood and accepted by their parents. Joo Wal didn’t have a family before Lady Seo took him from his home and took care of him. Eun Oh desperately wanted his mother’s affection. Even if it killed him, he still wanted his mother to love him and notice him. Arang also felt alone as a ghost. She was a loner and wondered why other ghosts were in groups and she was by herself. She always wanted to belong. I really recommend this to whoever is reading this. Wow! Although I didn’t read all of this post (because I plan on watching this one day), I did read quite a lot of it. So I’m definitely going to add this one to my list as well. My list is super long now. I really like the actress. Shin Min Ah. She’s really pretty. I liked her in My Girlfriend is a Gumiho.